A Plus Size Blazer is a great way to dress up any outfit. Mix and match your blazers to create a professional, career look, dress up regular pants (or skirt) and a simple blouse, or even to add some pizzazz to your favorite jeans. In cooler months, a great blazer can keep you warm and add polish to your look. Blazers are flattering to all figures - just choose the length and style that is the most flattering to your body type and stock up! 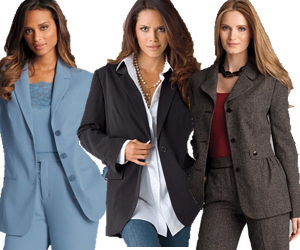 There are many considerations in choosing plus size blazers, the most important of which is your body type. This can become a multi-faceted part of your daily wardrobe when you choose correctly. Unfortunately a blazer that doesn't fit well is going to hang in your closet gathering dust. That means if you fall head over heels in love with a blazer and it fits your budget and your style, you may need to get it tailored. The end result, however, is something that will really pay for itself over time. While that may seem to be a lot of fuss over fit, it really does matter. Overly loose blazers do nothing for your body lines. If anything they can make you look larger. You need a blazer that create the illusion of height and give some definition to your waist for the best results. 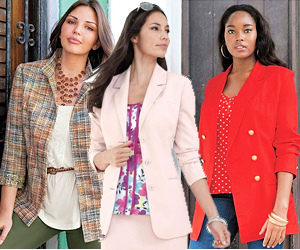 As with any piece of clothing the prices on plus size blazers vary greatly. If you anticipate just wearing one occasionally you can look to the lower end of the spectrum price wise at retailers. Bear in mind, however, that frequently the inexpensive blazer is often on in which its harder to find that ideal fit. For a blazer that you intend to wear readily - that's the time to consider spending a little (or a lot) more to get quality and longevity. As you're shopping for your blazer the key point for sizing is your shoulder. If a jacket doesn't fit properly on the shoulder, you do not want it. That seam needs to be spot on along with having enough arm length to reach your wrist. Altering this particular element in a plus size blazer is very expensive and typically not worth the effort. On the other hand if you have a solid shoulder point and the rest of the jacket is a tad loose, a good tailor can add darts to create the rest of the look desired with fairly little fuss. Another important element in your blazer is comfort. Bend your elbows. Put out your arm as if to shake a hand. Put your arms up as if reaching for a top shelf. You don't want your motion limited (which can lead to tears in the lining). This is also very hard to correct with alterations. Finally take a very close look at buttons. Double breasted blazer styles may not be the best option for plus size women. It just adds too much bulk. Stick to a single, vertical lien of sturdy buttons. Other nice features include pin stripes (to create a longer line) and long lapels (that slim). By following these basic guidelines you should end up with a plus size blazer that looks terrific.